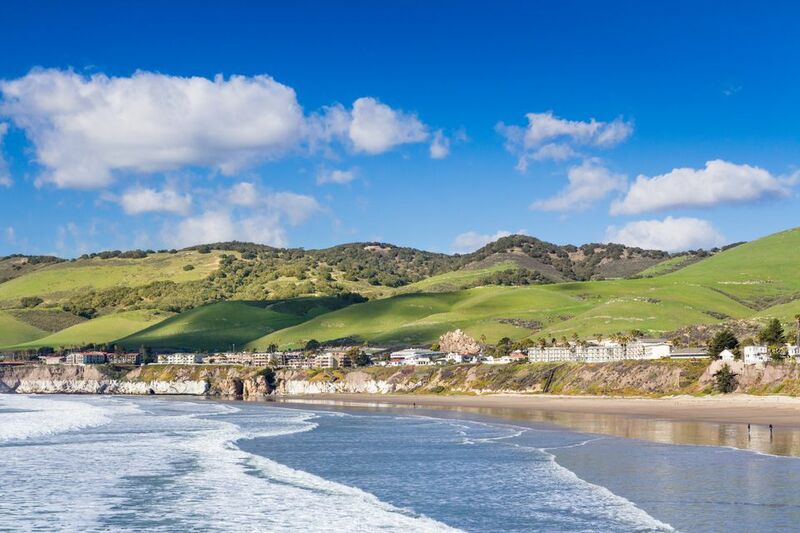 The scenic town of Pismo Beach, set on a cliff perched over white sand beaches and jaw-dropping ocean vistas, is a beautiful gem on California's Central Coast. Historically known as the "Clam Capital of the World," it is an ideal base from which to explore the Five Cities community of Arroyo Grande, Grover Beach, Oceano, Shell Beach, and Pismo Beach. The community is a cluster of cities in that area of San Luis Obispo County, along Highway 1 as it winds through the beautiful landscape south of Big Sur. Visitors will find many options for hotels in the area, with several offering stunning views of the Pacific Ocean. Take a stroll along the quarter-mile Pismo Beach Pier, located at the end of Addie Street, for fabulous views of surfers, seabirds, and maybe even a dolphin. At sunset, crowds typically form by the water to say farewell to the day. In 2018, the Pier underwent an 8.7 million dollar renovation and reopened with a refurbished structure and amenities that include restrooms, outdoor showers, volleyball courts, a children's playground, benches, picnic tables, and drinking fountains. Set high atop a bluff, the 11-acre oceanfront Dinosaur Caves Park, at the corner of Cliff Street and Shell Beach Road, has all the ingredients of a perfect picnic spot. The spectacular coastal views, manicured lawn, walking paths, and restrooms, make for a relaxing and photo-worthy spot to chow down. There is also a playground for children with sculptures of dinosaur eggs, dolphins, and a whale. To work off the meal, meander down the nearby long staircase to the beach and spy on seals or hunt for sea glass. You can choose from a wide selection of pedal-powered vehicles to rent from Wheel Fun Rentals at Seaventure Beach Hotel, including surreys, deuce coupes, choppers, quads, cruisers, tandems, and tag-a-long bikes. Or try the Fun Cycle, a three-wheeler that is custom made for riding on sandy terrain. All rentals come with a complimentary helmet and bike lock. Just south of the Pismo Beach pier, the Sandbar Surf Company offers lessons on the basics of surfing. Lessons are customized to meet every skill and ability level from the first-time student to intermediate and advanced surfers. Classes are available in a private or group setting, and the sessions have a maximum of five students to ensure each person gets individual attention from the instructor. During spring break and the summer months, Sandbar hosts three-day and five-day surf camps. It is well worth a trip to nearby Arroyo Grande or San Luis Obispo to visit Doc Burnstein's Ice Cream Lab for a dessert made the old-fashioned way, in-house. The authentic turn-of-the-century parlor serves over 64 flavors, including sea salt caramel, merlot raspberry truffle, mint fudge oreo, and Butterfinger blast. In addition, the frozen treat palace has monthly seasonal flavors, ice-cream cakes, and Tuesdays are an all-you-can-eat night. Grab a paddle at Central Coast Kayaks for its naturalist tour, which is perfect for beginners and explores the nearshore environment along the coast. Participants paddle between rock outcroppings and kelp forests and may spy otters, seals, and dolphins. Depending on surf conditions, paddlers might stop to explore tide pools which are home to crabs, starfish, sea anemone, and sea urchins. Does your family feel a need for speed? Head to Sun Buggy and rent two- or four-seat dune buggies or all-terrain vehicle and zip across the sand. For kids ready to take the wheel, there are mini ATVs available for ages 10 and up and single-seat Dune Buggy Jrs for kids 12 and up. Rentals are offered from one-hour to five-hours, and there are often special deals during on holidays. Designed for kids up to age 10, the nearby San Luis Obispo Children’s Museum is a fun place to explore rain or shine. Dozens of hands-on exhibits let kids role-play, create arts and crafts, and discover through doing. Inquire about the educational workshops scheduled each week, like magic milk printing and a bug curriculum. Daily admission cost is $8.00 for adults and children. Each year from late October to February, thousands of monarch butterflies flock to the Pismo Beach Monarch Butterfly Grove to seek shelter from the cold northern winters. The butterflies cluster in the limbs of a grove of eucalyptus trees at Pismo State Beach. Volunteer docents are on hand to answer questions and give daily talks. The Pismo Beach monarch colony includes an average of 25,000 butterflies and is a marvel to behold. Treat the kids to some old-fashioned fun with a night out at a drive-in movie. The Sunset Drive-In Theatre is located in nearby San Luis Obispo, shows the latest blockbusters movies in a double-feature, although there is no obligation to stay for the second showing. Arrive early to grab a good parking spot, turn on the FM radio, and sit back to enjoy the show. The theater has a concession stand but allows outside food. A local insider tip: Bring a blanket, snacks, and arrange a picnic in the space in front of your ride for an al fresco night of movie magic. Catch a bit of culture at The Great American Melodrama & Vaudeville. Located in Oceano, California, about three miles south of Pismo Beach, the theater has been putting on musical, comedy, and dramatic productions since 1975. Following each of the main stage performances, the ensemble unleashes an old-timey vaudeville revue that mixes song, dance, and comedy. This is a good option to entertain the entire family, as in addition to more series fare like Steel Magnolias, the theater has several productions each season geared for kids, like a comedic retelling of the classic Robert Lewis Stevenson book "Treasure Island." While it's not dinner theater, the venue does have a full bar and food concessions that make for a full meal, including hot dogs, popcorn, pulled pork sandwiches, salads, and more.